Ham is one of the star products of our gastronomy and there is no better way to enjoy it than accompanying it with a little bread and oil. In Enrique Tomás we love that you enjoy the Iberian and for that we offer you everything you need to enjoy its flavor. To begin with, we have bread and picos sevillanos, two perfect accompaniments for Iberian ham that, combined with a little white wine, red wine or cava, will be the delights of any palate. Buy as many units as you need and you'll see how good your food is today! 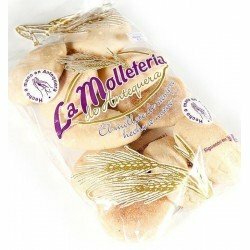 The mollete de Antequera is the food standard of the city that gives it its name, Antequera, a town in Malaga with just over 30,000 inhabitants that has managed to turn this rounded bread into an icon. Soft and with a very spongy crumb, this bread is perfect for adding a little ham and extra virgin olive oil or tomato and garlic, as is done in some places in Catalonia where the pà amb tomaquet is an essential starter at any table. 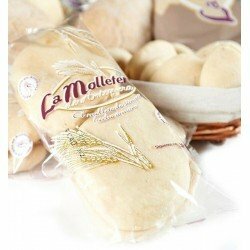 The mollete, based on the same ingredients as any other bread, is handmade and is slightly baked and lightly floured. It is a staple food of the traditional Mediterranean diet and is very healthy because it contains no fat and helps regulate cholesterol. In Enrique Tomás we have it in two formats, in a package of two units with breads of a superior size, or in packages of six units, slightly smaller than the previous ones. If you want to try it, just place your order online or buy it in one of our specialized stores, cut it and serve it. If you prefer it crispy, you can toast it a little in the toaster or even put it in the oven for a couple of minutes. You're gonna love it! This kind of sticks are typical of Andalusia and are perfect to accompany the ham with cava. Why? Because they help to cleanse the palate and, therefore, when you taste another slice again, you will enjoy the full flavour of the ham again. 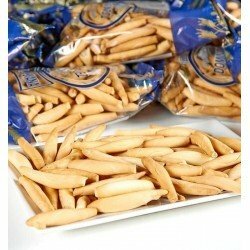 The Sevillian breadsticks are so crunchy due to their high water content and are also ideal for snacking between meals and to calm you if you get hungry before lunch or dinner. In Enrique Tomás we offer you the authentic Sevillian breadsticks, those of all time, because although there are others with onion or cheese flavour, the normal ones will not have more prominence in your mouth than the ham and, therefore, they will not palliate their flavour. Buy them now and enjoy!